No Lift Gate, We Can Handle It Ourselves. 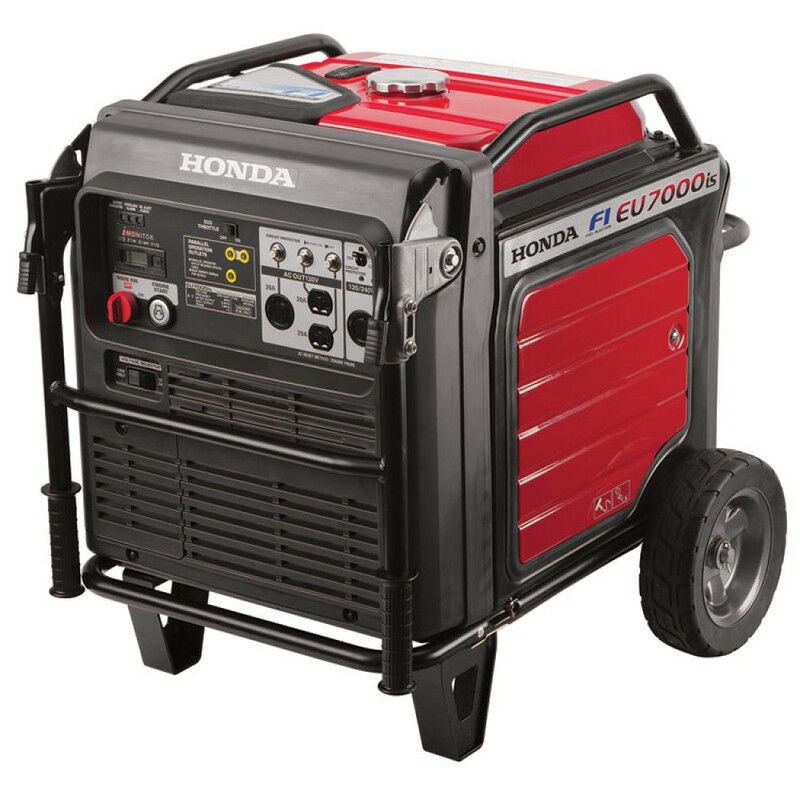 Perfect for home back up power, RVs, outdoor events, and more- The EU7000iS can operate a wide variety of appliances, making it perfect for portable use at home, camping, or much more. Electronic Fuel Injection offers better fuel efficency and lower maintenance- Electronic Fuel Injection offers better fuel efficency and lower maintenance Smart electronic fuel injection technology increases fuel efficiency, eliminates the engine choke, and reduces fuel associated carburator problems. And of course, the reliable Honda GX390 engine is designed for long life and superior performance. Super quiet - less noise than normal conversation- Super quiet - less noise than normal conversation So quiet, your neighbors will thank you. The EU7000iS operates at 52 to 60 dBA, which is less noise than a normal conversation. 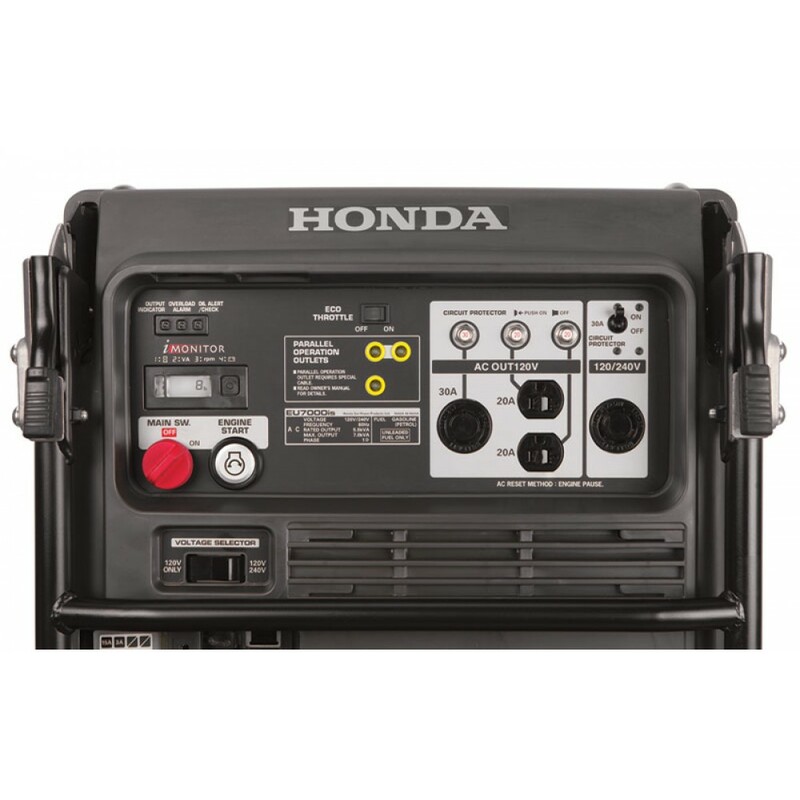 This makes it ideal for supplemental RV power, powering outdoor events, and any other activity that requires quiet operation. Fuel efficient - runs up to 18 hours on 5.1 gal. of fuel Fuel- efficient - runs up to 18 hours on 5.1 gal. of fuel Thanks to our exclusive Eco-Throttle System, the EU7000iS offers great fuel efficiency. Runs between 6 to 18 hours on a single tank, depending on the load. This makes it great for overnight power. Advanced inverter technology - reliable power for computers and other sensitive equipment- Advanced inverter technology - reliable power for computers and other sensitive equipment Honda's inverter technology means stable, clean power in a smaller, lighter package. 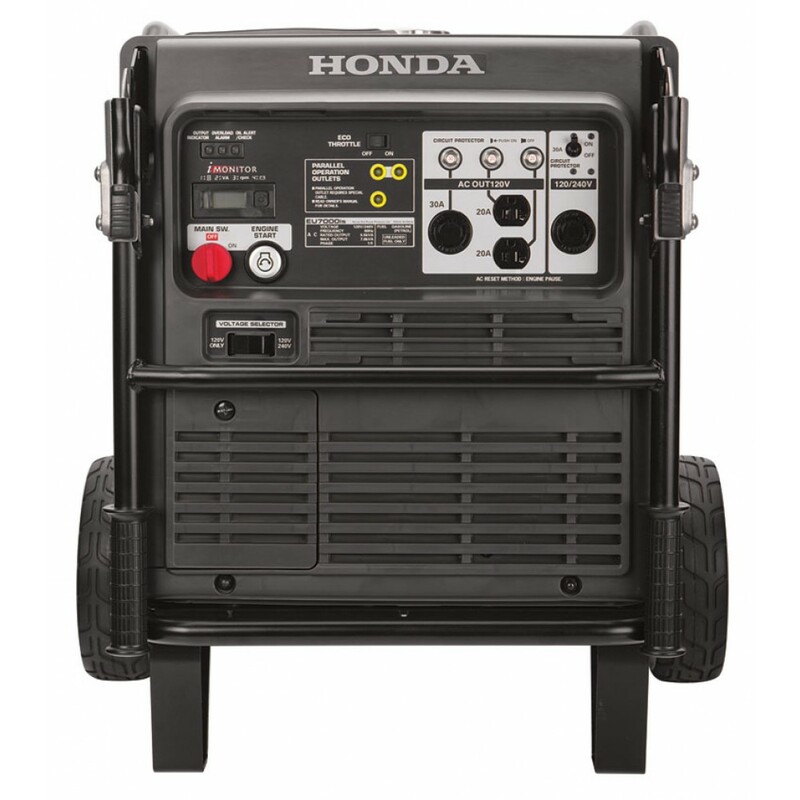 The precision of Honda's inverter technology ensures our inverter generators produce power that is as reliable as the power you get from your outlets at home. Easy folding handles- The EU7000iS has convenient handles that can be raised for transport and lowered for more compact storage. i-Monitor system tracks hours, RPM, battery volts, and wattage- provides information on hours of operation, wattage and engine speed, as well as diagnostics for convenient dealer service. 120/240V Selector switch - More usable power, more flexibility Choose between using both 120 and 240 Volts, or 120 Volts only. 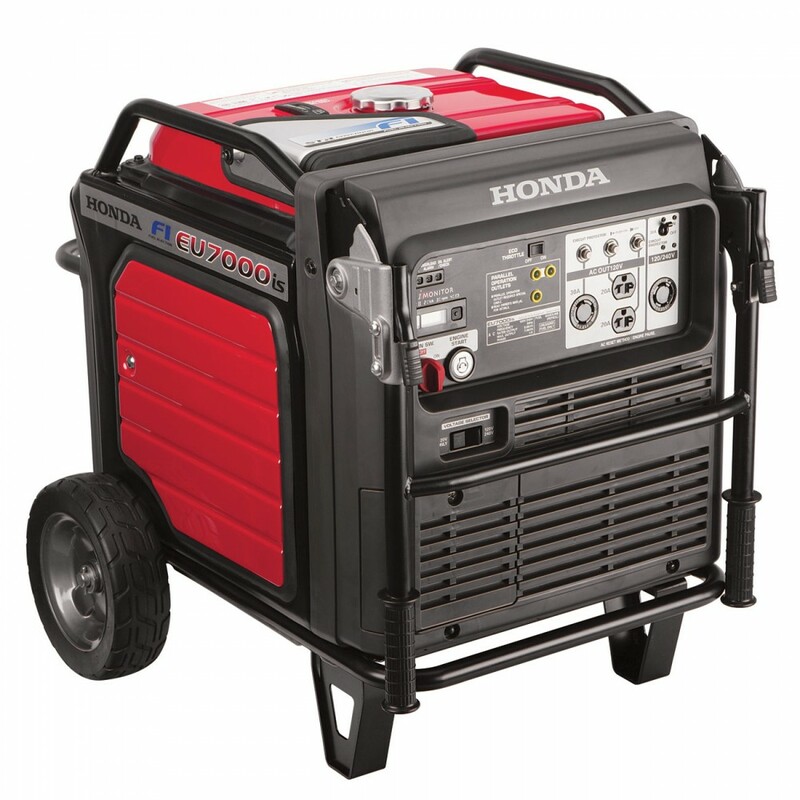 This allows for the total generator output to be available through any of the 120 volt outlets, limited only by the capacity of the individual outlet. This enables you to power units with larger wattage requirements. 3 year residential and commercial warranty- You can rest easy, knowing your generator is covered from top to bottom for 3 full years. Fuel Tank Capacity- 5.1 gal. Dimensions -(L x W x H)	33.3" x 27.6" x 28.4"